For the next few hours I lurk the best I can without consciously making the 15 attendees feel awkward. Everyone brings at least two bottles of beer to share, so a table of local ales like East Windor’s Broad Brook Brewing’s Pink Dragon Wit, several high-end sours and at least one homebrewed stout glimmer invitingly and serve as the focal point for mingling. Some munch on pizza and the conversation generally seems to be about… beer. Where they’ve had it, what they like, what they’re brewing, and what they want. One woman seems very excited about finding Hobbit Juice infused with cherry from Stonington’s Beer’d Brewing. It was just such a setting that Manuel was seeking when she Googled “girls who like beer, meet-up” a little more than a year ago. When GPO came up, she knew that she had found her community. Connecticut had had a chapter, but it had closed, Manuel explained. Since helping reignite CT GPO last year, Manuel has seen membership explode to about 1,400. “Sometimes you just want to be out without the boys,” she says, sipping mead from her tasting glass. Manuel and three other organizers in the state lead events about twice a month. 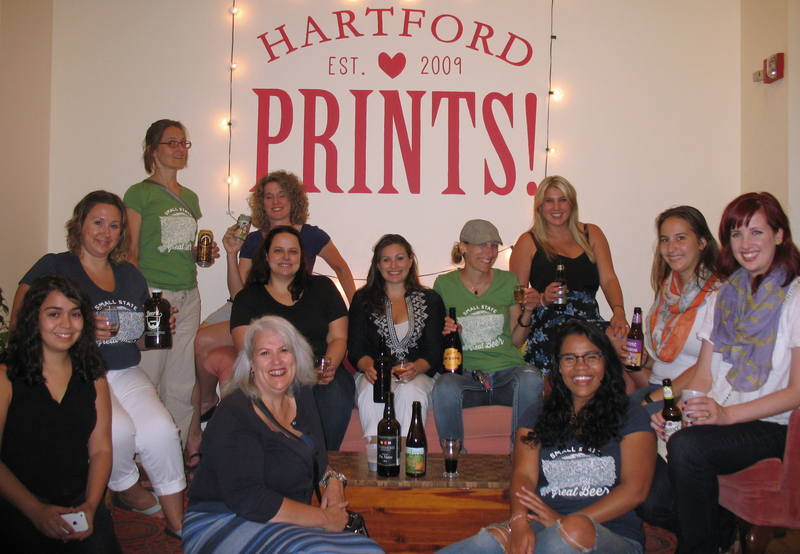 They showcase each location, which recently included Brew & Wine Hobby in East Hartford and Stony Creek Brewing in Branford. The point is to find a place where people can learn, create and have actual conversations instead of shouting over one another. Conversations with guys can be difficult when it comes to beer, according to Manuel, a Texas native who works as an actuary. “Men can sometimes ‘mansplain’ beer to women,” she says. In other words, we talk down to women, as if their little lady minds couldn’t possibly handle the complicated calculus that is alcohol-by volume, or the difference between lager and ale. I have made these stupid assumptions myself. Amanda Wishin, the national president of GPO, says that the growth of the organization to about 75 chapters throughout the country reflects a strong desire by women to form community around beer. “It’s always been thought of as a guys’ thing, and this sort of gives women who have always liked beer an outlet to explore interests and hang out with like-minded tastes,” Wishin says. 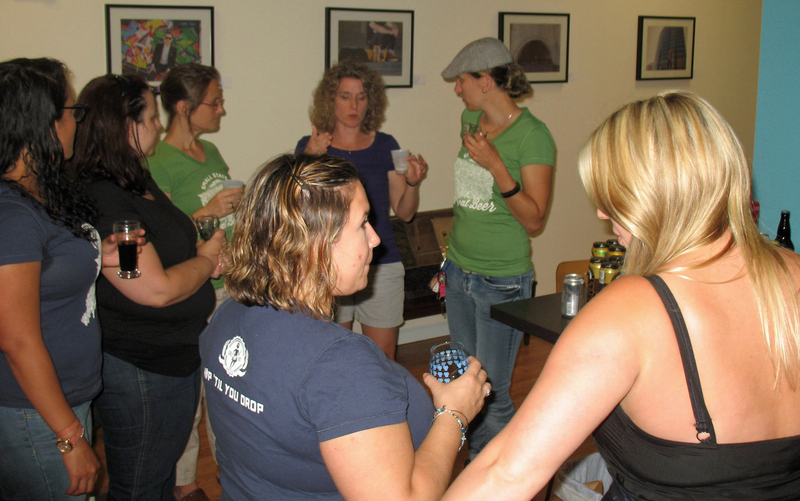 Many women who participate were not really “beer people” before, but have learned to love it. Is beer welcoming to women? I grew up in an era when beer meant beer commercials about guys debating whether their beer tasted great or was less filling (spoiler alert: it was less filling). The ads that didn’t feature Clydesdales featured women as setting instead of character. If you drank this beer, this attractive woman will sidle up to you, and not because she wants to engage with you about the merits of canning versus bottling. In other ads, women were simply placed in bathing suits just because. With the rise of craft beer during the past 10 years or so, the focus seemed to be shifting from female objectification to a look at the ingredients. Sam Adams ads had lovingly close-up shots of hops and the women who sipped the beers were dressed for work, not the beach. But over the past few years, even smaller breweries are turning to the age-old technique of using innuendo to sell their products. I’ve seen more “blond ale” labels featuring scantily clad women than I can count. Does a close-up of a woman’s bum for a beer called “Tramp Stamp” make you think of Belgian-style ale? Other examples exist that I cannot with taste put in a newspaper. By several accounts, women make up about a quarter of total beer consumption in the U.S. and nearly 40 percent of the market when it comes to craft beer. And while there are plenty of men and women who say, “Lighten up, bro, it’s just beer,” it’s a topic that deserves raising (and I’m hardly the first to do so). A Chicago writer who focuses on beer and science topics in her blog at metacookbook.com, Natasha Godard, says that gender stereotypes exist in the beer world just as they do outside of it. The craft beer population does not seem to be as diverse as it could be, and it’s a topic people don’t generally want to discuss, Godard says. “I think women’s groups in general are good across society, but particularly in things that are generally male-dominated or perceived that way,” says Godard. Especially, she notes, if they bring in members with a variety of ethnicities and ages. In some ways, GPO represents an oasis from all of that regressive, narrow-mindedness. Most of the participants showed some level of relief at finding out about CT GPO. Other participants talked about how CT GPO gives them a safe space to talk about beer and ask questions. A version of this column was originally published in August 2015 in the Waterbury (Conn.) Republican-American. This entry was posted in Beer Snob and tagged Beer Babe, Girls Pint Out, Meta Cookbook. Bookmark the permalink.